The Oregon Department of Agriculture has been dragging its feet on issuing hemp production licences for several years now, so maybe it shouldn’t have come as a surprise to me that the department just announced that it would stop issuing new licenses to Oregon farmers. Senate Bill 676 legalized the production of hemp all the way back in 2009, but the state took several years to issue the first license. The Department of Agriculture used to state on its website that no hemp licenses would be issued until a change in federal law, so the Measure 91 marijuana legalization measure included language that prohibited the department from relying upon the feds to stifle hemp farmers, but it looks like they have found reasons aside from Uncle Sam. The pause is essentially a win for Southern Oregon medical marijuana growers, who asked the Legislature last session to instill buffer zones and other regulations to ensure hemp and marijuana plants don’t cross-pollinate with potentially ruinous effects for both plants. The state’s hemp farmers, including some in Bend and several in the Willamette Valley, said the state was picking favorites between the two cannabis crops. Oregon voters legalized marijuana for adults 21 and older last November. Lawmakers in 2009 voted to allow farmers to grow hemp, which is still illegal federally because of it is in the cannabis family despite lacking psychoactive effects. After a lengthy rule-making process by the state Department of Agriculture, hemp farmers sought to get the first legal plants in the ground last spring and enter the highly profitable CBD oil market. The oil is sold to patients for its potentially soothing qualities on debilitating diseases and is a compound found in hemp and marijuana plants. Lindsay Eng, who oversees the hemp program for the Oregon Department of Agriculture, said Tuesday the law authorizing industrial hemp production in Oregon was written to regulate it as an agricultural crop, with large fields of densely planted hemp grown for fiber, seed and oil. Instead, the nine operations inspected by the department this year seem more interested in producing compounds known as CBDs, which don’t get people high, but are believed to have some medical benefits. They are also found in marijuana. As a result, Eng says the current law does not work well to regulate growers, who are growing small plots, sometimes in greenhouses, with the emphasis on producing buds that contain the CBDs. This surprise announcement won’t impact the 13 hemp farmers who have acquired licenses already, although I suppose that any hemp harvested will be even more valuable. The Department of Agriculture won’t consider issuing any more hemp farming licenses until after the 2016 legislative session, giving the state and its lucrative cannabis industry and could-be-lucrative hemp industry time to work out the details. I, of course, am a huge supporter of the Oregon cannabis industry and community and understand the fears of growers who don’t want their livelihood, or the health of the patients, hindered by hemp-pollinated cannabis. I am also a big believer in hemp as it has so many uses and is beneficial for our environment and our health (it is literally, the breakfast of champions). As many politicians state, “I’m not a scientist”, so I’m not going to presume that I have the right answers regarding the cross-pollination of hemp and cannabis, but I’ll continue to express my hope that there must be a good policy, based upon science, that will allow both hemp and cannabis to prosper in Oregon and help become a model for the rest of the country. 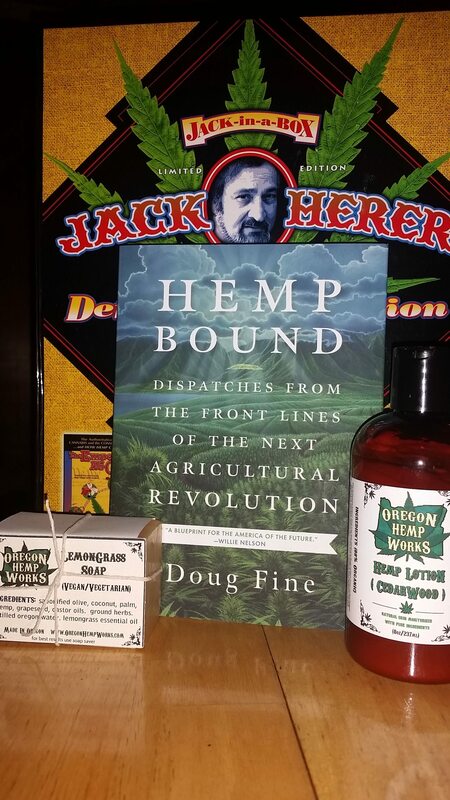 I don’t presume to speak for the late legend, but I’m guessing the Jack Herer, the godfather of the cannabis hemp movement, would hope that cannabis and hemp can find a way to coexist for the benefit of all of us.